What makes one person able to carry on when facing a challenge, and what makes another person give up? Great question and one I am asked all the time from audiences and when people read my books. I can only speak from my own experience but from an early age, in fact, when I was a toddler even, I always knew I would never give up. Aged almost 17 I lived on my own in a bed-sit, a one room apartment in an old house. I had no choice, my life at home with my parents was very up and down and my Mother asked me to leave after yet another argument so I left. I felt a little bit lonely, and this is when I decided to purchase a cat from a pet store, Suki, and she was my companion for a very long time. I found a solution to feeling lonely when in my bedsit, and it turned out to be a great way to share my love. When my Mother asked me to move back home I moved back home with Suki, who eventually stayed with my parents when I moved out to get married. I was alone, but I was fine in my own company. Obviously I missed living in a home with parents and siblings. I read, wrote letters to friends, listened to the radio, went to work, came back home, cooked supper, all the things that make our lives go around. This challenge lasted a year and I survived, because I had no choice. When I was diagnosed with breast cancer the first time I had no choice but to face my challenge and get on with it. It was then that I realised some people can’t face their challenges, and decide to hide them away hoping that the challenge will disappear, which obviously won’t happen. I don’t think of people who can’t face their challenges as weak, but I think of them as needing help, support and someone to support them whilst they find their way to cope. Finding a way to cope with any challenge starts when we wake up in the morning and continues right up until we go to bed and sleep until morning. Our first thoughts when we wake up could be “My challenge is still here, I can’t cope, what can I do”. If we changed our thought process first thing in the morning and thought to ourselves “It’s morning, a new day and a chance to deal with my challenge”, that’s a more positive thought and we immediately feel we have the power to deal with our challenge. Sadly if our first thought in the morning is not being able to cope, we often feel like we should stay in bed, curled up in the warm. Ignore the sunlight behind the curtains, ignore the doorbell, or the phone call, and sleep our challenge away. What if our first thought was positive versus negative. What if we opened the curtains and let the sunshine drown us in it’s warmth. What if we answered the doorbell and someone was visiting us who wanted to help us? What if we answered the phone call and we were invited to lunch, a way to spend time with someone who cares about us and a chance to share how we feel. Did you know our thoughts control our feelings? If we think we can do something we will do it. If we think we can’t do something, we won’t do it. It’s true, I have been there and you probably have too. Take control of your thoughts. Remind yourself when a negative thought pops into your head that you have the power to change your thoughts. Write a list of all the positive actions you have taken during the day to help yourself. Reinforce your positive thoughts by looking at the list before you go to sleep. Don’t let your negative thoughts make your sadness feel like the end of the road. You can feel angry but don’t let your anger take over. If you want to cry to get your frustration out of the way, cry, tears are a great outlet. Go to a gym and practice moderate exercise, or go for a walk by the river and generate thoughts of how wonderful life is, listen to the birds and you will feel motivated to think positive thoughts versus negative ones. The first thoughts you have when you wake up in the morning should be positive thoughts, however much your challenge wants to take over your life, you are in control. Admit you have a challenge and you will deal with it. (taken from my first book A Life Like Mine). Talk about your challenge with family, friends or a therapist, don’t hide your challenge away. Yoga and meditation help when you are feeling stressed or overwhelmed, both great ways to relax and concentrate on positive ways to deal with your challenge. Our biggest fear is that our challenge will ruin our life forever, or it will take over and our life will be different. Change is often unwelcome, but sometimes change is the best thing that can happen to us. How we perceive change can definitely make us stronger, or as if we have no control. Think of change as a different road, one you might never have taken before, but it’s an adventure. You might not like where the road takes you, but once again, think of this as a chance to make a choice that works for you. 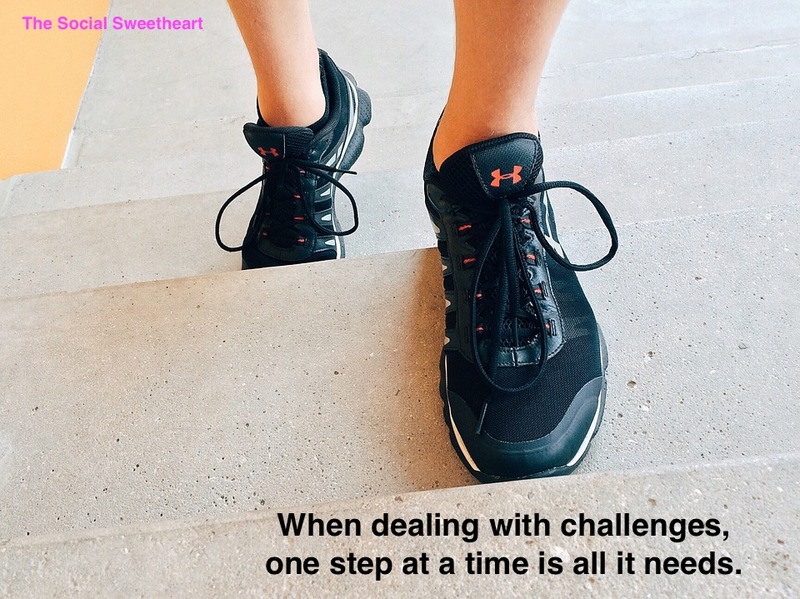 One step at a time is all you need to accomplish, when dealing with challenges. Our entire lives are full of challenges, big ones, small ones, urgent ones, serious ones, it’s a part of life that we have to learn to accept. Some challenges might never go away but we find coping mechanisms. Other challenges stay just a short time and then they are gone, forever. Accepting that everyone has challenges does help, no one likes to feel alone or these things just happen to them. Not everyone will share they are facing a challenge, but it is OK to admit you have a challenge. I write about all of my challenges, so far I have written three books and its a great outlet for me. 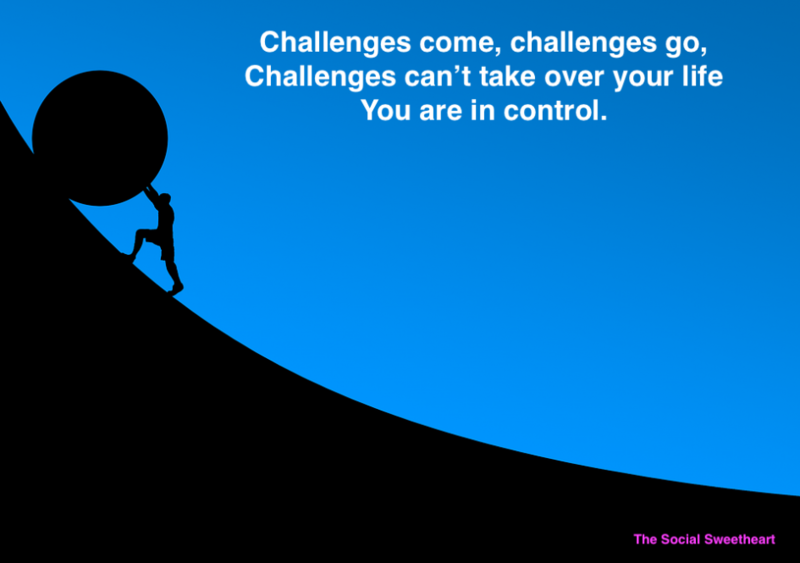 I talk about my challenges, in fact both my businesses have prospered because I share my challenges. I have strategies to share with others, tried and tested, and they work for everyone not just me. Look at me – I lead a relatively happy life, I am healthy to the best of my ability, I have built a life I love and I help thousands of people. Life does carry on, challenges can’t take away your zest for life and living the life you truly want.